Maybe the Grinch had the right idea. We hate to say it, but maybe doing away with the holiday season would be the best route to take. No more spending a small fortune on presents for friends and family and no longer worrying about what dish to pass for Christmas dinner would be such a relief. Forget about having a decorated pine tree in your living room shedding needles all over and not having to hassle with the Christmas lights would be nice too. If you're on board with the Grinch's original idea to completely cancel the holiday season, then the men's deluxe Grinch Santa costume is exactly what you need to turn the jolliest season into a manageable, enjoyable, stress-free time. 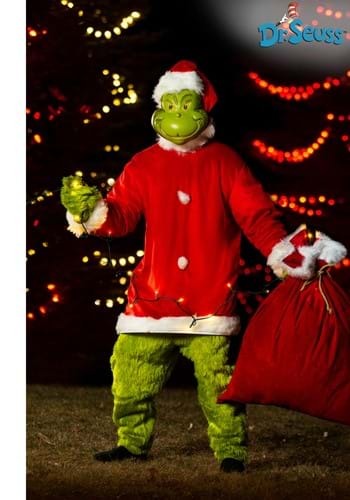 We're not condoning breaking into homes and stealing presents and nabbing their Who Hash (we love Who Hash, it's one of our favorite meals actually), but if you want to make it known you're planning on skipping all the Christmas festivities then just disguise yourself in this Grinchy get-up and those around you will get the hint that you're not planning on standing under any mistletoe this year! This is a deluxe costume that comes with everything needed for your all-green transformation. The fur jumpsuit fastens together with a simple hook and loop fastener while the Santa suit tunic, featuring furry pom-poms and furry cuffs, fits easily over it. 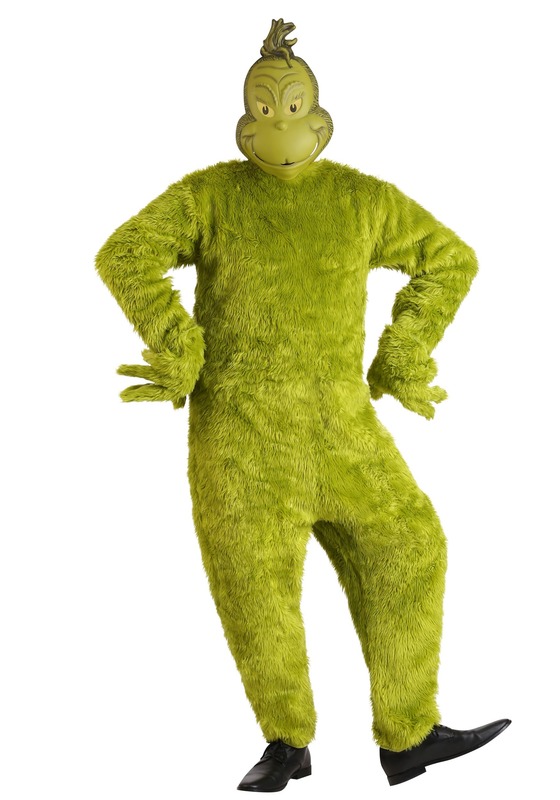 The included gloves are covered in the same green fur as the jumpsuit so you look green and fuzzy from head to toe. Finally, the character mask and Santa hat complete the costume. The molded plastic mask has an elastic band able to comfortably stretch around all head sizes. Although you're not jazzed about Christmas, you can never turn down a reason to party. 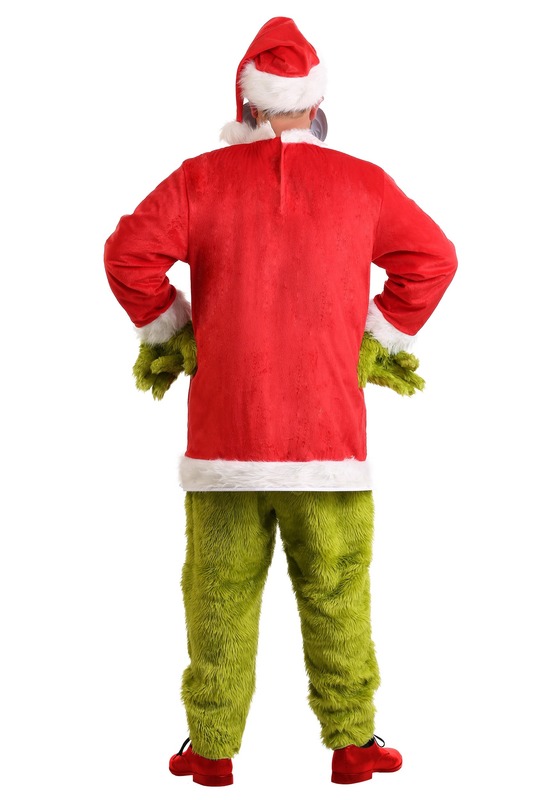 Hit up all the Christmas parties you're invited to wearing this costume. Awesome but the mask could have been from the dollar store.. The costume itself was great, my only issue was the mask being so cheaply made. It honestly reminded me of something from the dollar store and for the price of the costume I feel it should have been way better quality. The mask is thin plastic. Wore it to a Christmas party for the kids and they could see the back of my head since it’s just a mask for the front of your face. They chased me around calling me the fake grinch. Haha, funny but also disappointed.